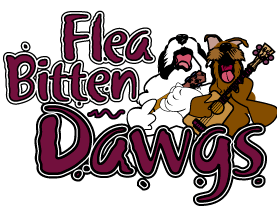 The Flea Bitten Dawgs came together as a group after recording a video promotion to benefit KDHX 88.1 Community Radio in St. Louis, Missouri, February 2010. The rendition performed was Irving Berlin's Russian Lullaby, done with a couple days of rehearsal and David playing a ukulele he borrowed from Thom, as he didn't own or play one at that time! The video has had over 11,000 hits on YouTube! Since the band came together, they have played in ten states, have had radio airplay on seven stations, including one on the big island of Hawaii, released three CDs and have had over 40,000 views on YouTube as well as fans' videos. A mini-documentary has been filmed by a PBS station on Thom and the Flea Bitten Dawgs' involvement with ukulele in St. Louis, plus they were also featured in the doucumentry "UWC V: A Field Guide" about the Ukulele World Congress. In 2015 Michael "Supe" Granda of the Ozark Mountain Daredevils recorded one of Thom's original songs "My Dog Bob". The Dawgs have shared the stage with Gerald Ross, Victoria Vox, Brook Adams, Cali Rose, Donna Frost, Peter Moss and Stuart Fuch. 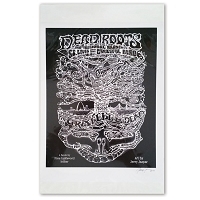 They have played with Gerald Ross, Brook Adams and David Ganz from the Grateful Dead Hour. 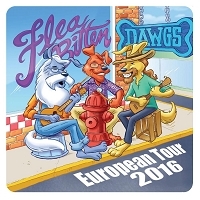 In May, 2016, the Flea Bitten Dawgs will be traveling to Europe for their first tour out of the states! Peacemonger Jerry will be on tour, helping with merchandising, photography and some bus driving, and general shenanigan supervisor. Check out their concert dates calendar.